Remember that superlative Asador called Etxebarri I wrote about last year? That amazing restaurant where the chef makes his own charcoal and grills everything, even oysters like the ones in the picture above - and they were grilled out of the shell! That little place has been enjoying very good press lately, the chef, Bittor Arguinzoniz, was voted best chef of Spain in 2006, the restaurant was featured in Men's Vogue, Bon Appetit, Food&Wine, and many other publications. Well, I just found out - thanks to Chez Pim's commenter Karin - that they now have their own website. That's very cool. You should go check them out. 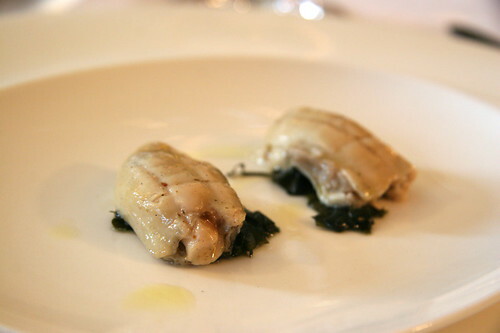 I took a great trip down memory lane going back to my original post on this restaurant, looking at the amazing parade of dishes coming out of that marvelous kitchen. I suddenly realized it's been far too long. I am overdue for another meal. Soon. I hope. Can't score a reservation at elBulli for this lifetime? Try a few of Ferran Adrià's top tips for home cooks and make your own elBulli Lite™ meal at home. In this video clip Ferran Adrià shows home cooks a few good tricks. Some are rather neat, like a frozen Mojito you can keep in your fridge for a whenever Mojito fix, or using a simple peeler to make rather sophisticated-looking petals of avocado, or some very pretty bites of bread and chocolate seasoned with salt and olive oil. There are also one or two Sandra Lee moments in there: a bit of rum in this, vodka in that, and also an odd, whipped concoction made with mayo and canned tuna, and then mayo lightened with whipped cream. On second thought, that last one is probably more a testament to the Spaniards' love of all things mayo-ed - there are myriads more in the clip. Heh. Oh, yeah, and who knew Ferran read Martha Stewart Living? If you followed his advice then a kitchen without a Siphon and a good stick blender would be entirely unworthy of your cooking talent. I agree with him on the stick blender, and I actually have a lot of fun with a Siphon, but I should warn you that though the Siphon itself is inexpensive enough, it's the cartridges you need to make the thing fizz that'll kill ya. On second thought, with the Mojito para todo el dia, who cares about an overdue credit card bill or two, yeah. I don't know what show this clip originally aired, but it appears to be a TV show in Spain. My friend Roge, the blogger behind PistoYNopisto sent the link to me and I had a lot of fun watching it. The video is long, nearly an hour. Consider yourself warned. That's an hour of your life you won't be able to take back. Don't come crying to me afterwards. If you didn't feel like spending a whole hour watching this thing. Here's the list I made from it – the snide comments are entirely my own, of course. By the way, if you want to buy anything he recommends (or a close approximation thereof), I've put them together in my Amazon Store for your shopping convenience. 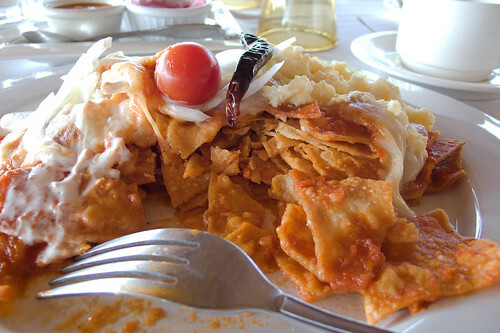 My favorite breakfast in Mexico, Chilaquiles - quite possibly the best use of stale tortilla chips, ever. I have no idea how this is made. I vaguely suspect heating the day-old chips in some sort of smoky chile sauce. The Chilaquiles I've had often have bits of queso fresco crumbled in and hidden, half melted, in the soft yet crunchy layers of chips. There's also sour cream, and perhaps even some onions. And eggs, on the side, of course. I have to learn how to do this. Does anyone have a good recipe? In my previous life I worked in design research, obsessively trying to devise elegant solutions to complex problems. Old habits die hard, so it makes me happy every time I come across an elegant solution, especially in an unexpected place like in San Jose del Cabo, Mexico. Ok, this wasn't exactly as elegant a solution as the fly-in-the-urinal at Schiphol airport in Amsterdam* but it's pretty darn good. 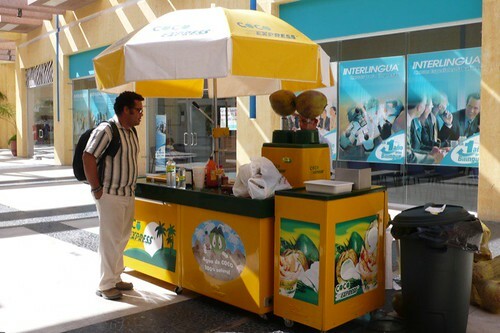 I'm talking about a simple coconut cart I found in a strip mall just outside of San Jose last week. They sell coconut meat and coconut water. Instead of using a clunky and often unhygienic machete to lop off the top of a coconut to get to the sweet water inside, this little cart presents a lovely solution to the mess. The cart comes equipped with a lever and a sort of probe. Place a coconut under it, pull the lever, the probe goes in and drills a hole, with ease to boot. Take the coconut, invert it over this thingy that drains the water into a machine that instantaneously cools it. Now the refreshing coconut water can be poured and sold by the glass or in liter bottles. Brilliant. Just brilliant. It's gonna take more than mud to dampen our Jazz Fest spirit! arginine on When life hands you a goose egg.. The Ethicurean: Chew the right thing.